Last week I was thumbing through my stack of vintage Better Homes & Gardens issues when I landed on what seemed like the perfect storm of Thanksgiving desserts: pumpkin pecan pie. I mean, think about it...those two pies are probably the most frequently made baked goods this time of year, so why not bring them together in culinary bliss and see what kind of baby they make? Well...I did. And this baby is goooood. 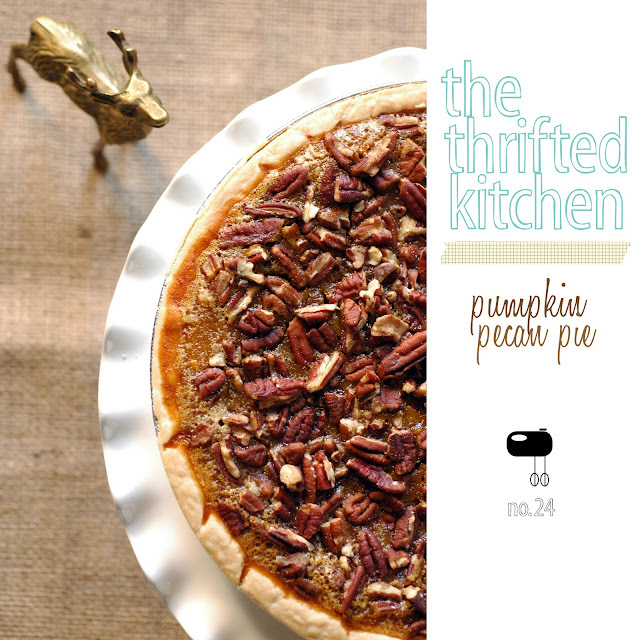 The texture of a classic pecan pie with a nice pumpkin taste and crunchy pecans on top. Ooooo-weee! In a small mixing bowl, combine eggs, pumpkin, sugar, corn syrup, vanilla, cinnamon and salt; mix well. Pour into unbaked pastry shell. Top with chopped pecans. Bake in moderate oven (350 degrees) about 40 minutes of until knife inserted halfway between center and edge comes out clean. Chill; serve topped with whipped cream. Makes one 9-inch pie.